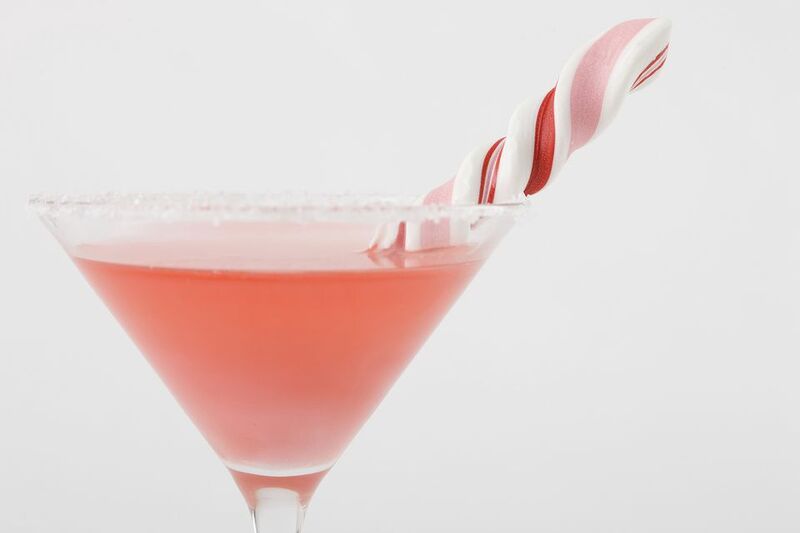 The candy cane is a fun holiday cocktail that is simple, sweet, and captures the best flavors of the season. When you need a delicious drink featuring berries, peppermint, and chocolate, it's a fabulous recipe that's sure to put you in a festive mood. This recipe comes from SKYY Vodka and the combination of flavors is very interesting. It begins with a base of berry-flavored vodka against the sweet taste of peppermint and chocolate. The fruity sweetness of grenadine accents the berries and the cream transforms it into a luscious cocktail. Rim a cocktail glass with crushed peppermint candy, using one of the liquid ingredients to wet the rim. Pour the vodka, peppermint schnapps, white creme de cacao, and grenadine into a cocktail shaker with ice. Fill with half and half and top with a splash of soda water. If you like, skip the splash of soda, though you will find it adds a nice little sparkle and brings a lightness to what can be a rather heavy drink. Though no longer promoted by the brand, Skyy Berry Vodka can still be found at some liquor stores, both online and off. It's not entirely clear which types of berries were used to flavor it, but it was likely a blend. As an alternative, you can go with Skyy's blueberry, raspberry, or wild strawberry vodkas. A number of other vodka brands produce a blended berry option as well—most include blueberry and strawberry, sometimes raspberry. Look for bottles like Belvedere Wild Berry, New Amsterdam Red Berry, and Pinnacle Berry. You can certainly use dark crème de cacao if you have it in stock without changing the flavor. The white (clear) variety of the liqueur is preferred because the drink will then have a pretty pink color. Be careful about pouring high-proof peppermint schnapps because it will have a stronger flavor and may overpower the cocktail. If you choose one, consider using less—1/2 ounce or so—to keep the drink in balance. If you skip the candy rim, an appropriate garnish for the candy cane is, of course, a candy cane! Hook one on the rim, letting the long end rest in the drink or simply place a peppermint candy stick in the cocktail. Either way, it doubles as a stir stick! How Strong Is a Candy Cane Cocktail? Despite having three distilled spirits, the candy cane is a surprisingly light cocktail. It should mix up to have an alcohol content around 11 percent ABV (22 proof), so it's like drinking a glass of wine, only much sweeter!